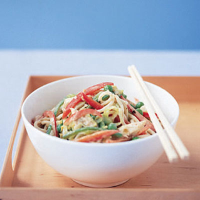 This dish combines speed and convenience with the flavours of Asia. It's a tasty supper that all the family will enjoy. Heat the oil in a large frying pan and fry the turkey for 5 minutes, until just coloured. Stir in the Thai paste, then add the pepper and cabbage, and stir-fry for 5 minutes, until starting to soften.